Restore the interior of your 1984-1986 Mustang with this charcoal gray deluxe door panel kit for manual window Mustangs! Restore the interior of your 1984-1986 Mustang coupe or hatchback with this deluxe door panel kit from TMI! Over the years, door panels can warp or deteriorate from water getting behind the panel and penetrating the door panel board. This can cause the material to separate which makes for an unsightly look in your Fox. TMI has the perfect solution with this pair of fully assembled Mustang door panels. This kit includes new inner belt weatherstrips, door lock knob grommets, lower door carpet and a driver's side map pocket. No assembly required, all you have to do is pull them out of the box and install them on your Mustang! This kit features a charcoal gray finish and is a perfect restoration item for your interior. - Will not fit convertible. - For Mustangs with manual windows only. - Diamond perforated upper panel (correct for 85-86). - Correct chrome plastic trim insert. 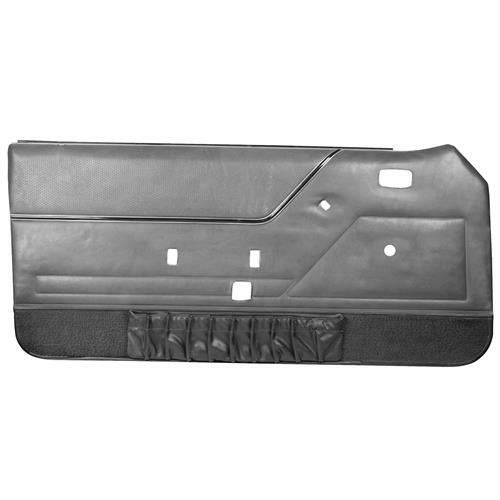 This set of Mustang door panels ship with the material covering one side of the door panel without cutouts. The back side of the door panel board has perforated opening locations for such things as door handles, window cranks, electric windows, speaker covers, etc. After the "X" cut is made you can fold back the material so you can install door handles, armrests, etc. If desired, you can tape of glue the flaps of material to the backside of the board, but it is not required as once the hardware and door panel are installed, you will not be able to see the loose material.